I read an article the other day that touched on leadership behavior. It sparked an abundance of memories, thoughts and questions that have rolled around in my head for many years. Quite frankly it made me look deep inside of my soul and check my heart to ensure my actions and motives line up with my moral convictions. Look, leaders are people. In fact, many are good people. There is a very small percentage of leaders that act and behave poorly. I feel I’ve probably worked for more than most. My career has been full of poor leaders. Heck, there are a lot of my past and present employees that might say the same about me. The whole reason I began my leadership journey was to do everything I could NOT to make the same mistakes or do the same things I have witnessed or gone through. IT’S ALL ABOUT YOU– No it isn’t! In fact, we probably don’t care what you did or where you went. It is about those you lead. When every conversation and situation is about you, it limits the interaction and contribution of others. I’ve had many leaders more concerned about how situations affect them, than the one(s) involved or affected. HEY BUDDY -Considering those you lead as friends. Not good. Leadership is about relationships, not friendships. When friends and buddies don’t perform we tend to “sweep” it under the rug or make excuses, rather than hold them accountable. This creates descension and frustration with other employees. Build relationships, not friendships. I’ve seen many leaders lose credibility over the hiring or advancement of friends or relatives many times. I am not saying you can’t hire employees from the past or those who supported and assisted you at other jobs. I was the best man at my Director of EHS’ wedding 29 years ago. However, I bet he will tell you that he is held to the same accountability level as anyone else. In fact, I expect more out of him, than most. HORRIBLE LISTENER – blah, blah, blah……. This leader doesn’t care what you have to say. They are only concerned with what’s coming out of his mouth. Their EGO gets in the way. Hey man, you were given 2 ears and 1 mouth for a reason. You need to listen twice as much as you talk. Give people a chance to say something. Who knows, what they have to say might solve the problem. WHAT ARE YOU THINKING? -Poor communicators can reduce and harm aculture and frustrate employees quickly. Many employees complain about the lack of communication from leadership. What are my expectations, How is the company performing?, Will there be raises or bonuses this year? As I coach leaders, I encourage them to have weekly or monthly communication meetings. This is a time where all they do is communicate key information and allow employees an opportunity to ask questions. DON’T TEXT ME -Technology is great, but technology has created a diminishing environment of face to face communication. How many times have you received a text or email and interrupted it as negative? Texting and emails are very difficult to communicate a tone. A face to face visit is the best way to properly communicate. I can see your facial expressions and body language and I can react or change my tone or words to ensure effective communication. If you can’t meet face to face, call them, and don’t leave a voice mail to cover your items. REALLY? –Hear’s a thought……Get both sides of the story before you make a decision. 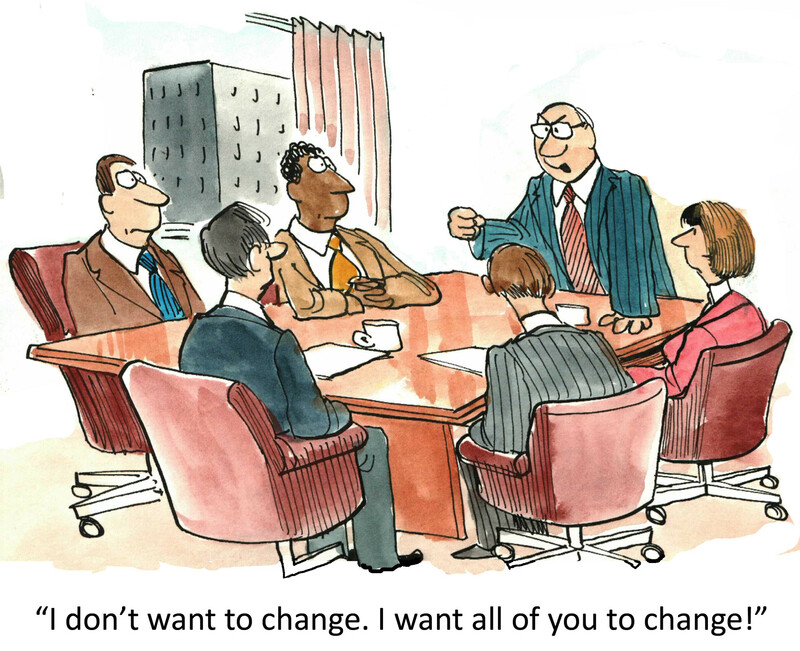 One of the most frustrating things for employees is when a leader makes decisions based on a one sided conversation. One of the traits of a leader is to be open and accessible. However, that doesn’t mean you base your decisions on the conversations of one individual. I found many times, my accessibility and openness has allowed individuals to voice their displeasure with a supervisor, rule or practice only to find out in my follow-up conversation the individual was disciplined or held accountable for failure to comply with or follow directions, etc. THAT WILL NEVER WORK– Being cynical is not a trait of a leader. In fact, it is totally opposite. I think cynical leaders feel threatened. They must discount or even put down a person’s ideas because they feel as if they are not a leader if they don’t have the answer. Cynical leaders say; “No, that’s not going to work” or, “I don’t know why we are doing this; this is stupid.” Look, if something is stupid, then the leader needs to fix it. If something is not worth doing or is going to create major problems, it’s your responsibility to facilitate other ideas. Regardless, you must thank and encourage those who offer ideas and opinions, not BELITTLE them! THAT’S DISGUSTING! –Just because you can say it, doesn’t make it right. Foul language is wrong and unprofessional. For some reason, leaders feel they have the right to use foul language and tell questionable stories in front of their staff or employees. I recently had a leader use very disgusting language in reference to a football game. It stunned the group. No one knew how to react. I have had several occasions where leaders would use foul language in an email or text. Regardless of the communication, it is WRONG! Some have told me, “you have to talk in the language of the industry”. What? Come on man!! If that is the case, then we need to clean up the industry! It doesn’t matter if you are playing, it is your normal language or if you are angry, foul language is wrong, no matter what! Whether it’s anger, disgust or this is how you talk to your friends, you can’t bring it to the office. I can tell if a person has leadership qualities by the way they talk to others. YOU CROSSED THE LINE! –Leaders who compromise their integrity for business or profits are FOOLS! A lack of integrity from leaders doesn’t just annoy employees, it appalls them. In fact, when a leader shows a lack of integrity, employees become de-motivated. When a boss breaks or fudges the rules, cheats, lies or indulges in behaviors that reveal a lack of moral principles, he loses respect. respect, you can’t influence. If you can’t influence, you can’t lead. In addition, when a leader lacks integrity, he gives employees permission to do the same. I’ve seen leaders compromise their integrity and moral values to be validated by others. I have personally seen this take place and the destruction it causes. A true leader will never comprise their moral integrity for validations. Being a leader is about doing the right thing and leading by example. You simply cannot have one standard for yourself and one for everyone else. Treat people the way you would want to be treated. If some of these sound familiar, then do something to correct them immediately. The longer you continue the easier it is to continue. Next Post Next post: You Told Them! I believe Von Miller of the Denver Bronchos may be reading this blog. It showed in some of his quotes during his press conference after his MVP performance. Influence works with great D! Von Miler is a class act. Apparently he has some leadership ability by understanding the concept of influence. Thanks for the comment.